Below you will find a collection of great deals and discounts for Black Friday, Cyber Monday, and the Holiday season. We will continue to update as more deals are discovered and shared. 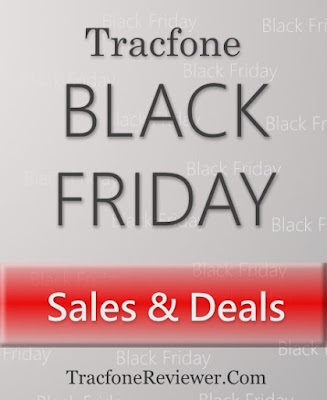 Black Friday is the biggest day for discounts on all kinds of stuff including Tracfone devices and minutes. But it can always be challenging to figure out which stores have the best deals, or even what deals they may be offering. For those who might not know, Tracfone is a prepaid wireless cell phone company that provides both airtime and cell phones. They are one of the cheapest cell phone options available, but you do pay for each minute, text or megabyte you use. Learn more about Tracfone by visiting our Beginners Guide to Tracfone. Tracfone also allows users to bring their own device to Tracfone, opening the door to many of the top end smartphones some consumers desire. Visit our Tracfone BYOP page to learn more and view a growing list of phones to use with BYOP. In this list of Black Friday deals we will include everything we can find, both reports of in-store deals and links to the deals on other websites. We want to include as many options to help you find the best deals on a new phone or minutes. So let's get to the deals and savings! We will collect all the Black Friday, Cyber Monday and any other holiday deals below and continue to update, so check back often! That concludes our list of Tracfone Black Friday deals, but we will continue to add to it throughout the shopping season. We need your help! Share any deals you find and we'll include them here and post 'em on the Facebook page for everyone to see. If you're looking for a new phone consider visiting our Cell Phone Reviews page where we have collected a number of reviews of different Tracfone devices. You can also compare and learn more about the Android devices offered by Tracfone on our Android Tracfone List. We will be creating a Christmas Gift Guide soon so be on the lookout for that too! Thanks for visiting and we hope this helped you locate some great deals for Black Friday and the Holidays! Tracfone Match & Win - What Is It? In this post by TracfoneReviewer we share information on a contest offered by Tracfone between October and November of 2015. We hope this information will be useful and help you win some prizes! 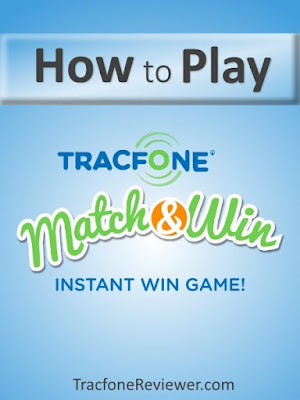 Learn about the Tracfone Match and Win Contest here! Towards the end of October I received a text to my Tracfone cell phone promoting a contest and sharing a link to click for more details. I immediately thought it might be a scam and didn't click the link, and soon forgot about it. Then a few days ago I was on the Tracfone website and noticed a promotion for the Tracfone Match & Win contest there. Following the steps I quickly learned that it was a legitimate contest from Tracfone offering the chance to win prizes for Tracfone users. The text I had received about the contest looked like something that followed the general scam pattern - 'Win something great, just click this link/give us your information'. I'm confident in confirming now that it is not a scam, and is a real contest form Tracfone, in case anyone was concerned about that. But what is this contest, how does it work, and how long will it be available? We'll share our answers to these questions and more below! For those who might not know, Tracfone is a low cost cell phone carrier that contracts with other major carriers like AT&T and Verizon to use their cell towers for providing prepaid coverage. Tracfone is great for consumers who would prefer to be charged based on how much they use their cell phone, rather than a flat fee. Tracfone offers a variety of cell phones to use with their prepaid service, and you can visit our Cell Phone Reviews page to see many of them reviewed by us. You can also bring your own phone to Tracfone with their BYOP program. Follow the link to learn about which phones will work. Now let's start sharing details on what this Tracfone contest is all about. The Match & Win contest is a promotion sponsored by Tracfone that runs from October 8th, 2015 through November 25th, 2015. This contest is put together by HelloWorld Inc, a company that specializes in social media and web marketing. To be eligible to win prizes, contestants must be at least 18 years old, and live in the United States. You will also need to have a Tracfone account. You can take a look at the full contest details in this PDF. There are quite a few prizes for this contest, although many of them are of lower value. There's almost $15,000 worth of gift cards and magazine subscriptions available for contestants to win, but there is a limit of only once prize per person. For those who are already Tracfone customers, it doesn't cost anything to play this contest once a day, and possibly win a gift card, even if it is only worth $5. To enter the contest simply visit the Match & Win website and start from there. You will be required to register the first time you play the contest, by entering your first and last name, the email address connected to your Tracfone account, and your Tracfone telephone number. Each time you return and play (which you can do once every day) you will have to confirm your phone number. So if you don't have an account with Tracfone already, you will need one for this Contest. Obviously, if you don't have a Tracfone phone number, you can't play. No purchase is necessary for this contest, and you can return to the contest page everyday for a chance to win until the contest closes. Once you are registered and logged in, you will be directed to a page with three options to click, and you get to choose one. So far in our testing, if you have multiple phones under one account, you only get one play for the entire account. Let us know if you win! We want to hear if anyone wins anything, and if so, what did you win. We've played three times, and won nothing so far. Is the Match and Win Contest Rigged? One user posted on the Tracfone forums their concern about the contest possibly being rigged. Take a look at the forum post here, or see the image of the post on the right. The user took a look at the source code for the contest page, and pointed out that it has already determined he hasn't won, before he selected anything. This could suggest that, either no winners will be allowed at all and this contest is rigged, or that a winner is determined when the page loads, not when one of the three options is selected. It would seem more likely to us that the second theory is correct, but we don't have any proof, nor are we experts in coding. What may occur is, every so often, the page loads a 'winning' page, giving contestants the chance to win, while the majority of the time it is just loading pages with no winners. The interesting thing about this is, you can check before you select an option, whether any of the options are winners if you know what to look for in the source code. We're not suggesting you try this, or that it will work, it's just an observation. We'd really love some input from those of you who might have experience with coding, and can confirm/explain what is going on here. Also, if we do start getting comments from people who are winning, that would confirm the contest is working properly, and assuage most concerns. When the contest concludes, there is supposed to be a list of winners published. Check back, as we will be updating this as we learn more. If you're new to Tracfone, take a look at our Beginners Guide to Tracfone which will walk you through some of the basics of how Tracfone works, and what options you have for using them. We share lots of information about Tracfone on this blog, so don't be afraid to browse the homepage, or use the search box on the right. You can also join over 1400 followers on Facebook where we share news, promo codes, and each new post. Each month TracfoneReviewer collects and shares the latest promotional codes from Tracfone. We work hard to find and post only the latest codes that are working for this month and hope you find a promo code that works for you! 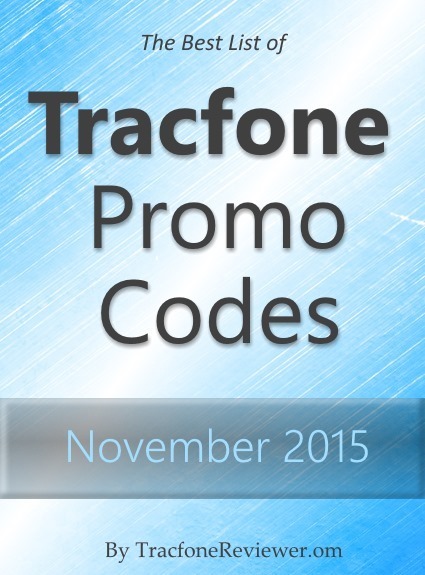 Tracfone Promo Codes Nov 2015! Tracfone is a prepaid wireless phone company that provides both cell phones, and cell phone service by contracting with other major cell phone carriers to use their coverage. With Tracfone, each time you add an airtime card to your phone you can also use a promo code to get additional minutes for free. Each code is for a specific airtime card amount, but can also be used with cards of greater value. For example, a code for a 60 minute card can also be used for the 120 or 200 minute cards and so on. Tracfone does not allow promo codes with their newer Android Smartphone Selection, but these phones already offer a lot of great features. Phones that you bring to Tracfone through their BYOP program will also not accept promotional codes. If you're looking for a new phone, visit our Cell Phone Reviews page, which includes a variety of different phones, both Android and non-Android. The bonus coupon codes listed below are just the newest codes we have found for the month of November. You can view all the codes we've found on our main Tracfone Promo Code page. Now let's take a look at the list of codes for this month. These codes are for use during the month of November. Some codes can be used multiple times, others only once. You can add codes on the Tracfone website, over the phone, or on your phone. 120 Minute Card try the code above, and we'll update when we find a new code! These are the latest Tracfone coupon codes for November 2015 and we hope you find a code that works! Leave a comment below with which code you tried, and how it worked (Or let us know of any new codes!). You can keep up with the latest Tracfone news and information by checking back on the blog here, or simply follow us on Facebook! We recently shared our picks for the Worst Tracfone Device Ever and are interested in what your experiences have been, so take a look and let us know. If you're still new to Tracfone, you should really check out our Beginners Guide to Tracfone that covers a lot of the basic and general information regarding using Tracfone. Thanks for visiting and we hope you enjoy the free minutes!